Linear Inequality is most fundamental in the world of mathematics often tested by Jamb and other exams. In mathematics a linear inequality is an inequality which involves a linear function. A linear inequality contains one of the symbols of inequality: < is less than. > is greater than. ≤ less than or equal to.≥ greater than or equal to. Solving inequalities does not create any problem, as the approach, manner and steps are the same as in linear equations. This rational function will be zero when the numerator is zero. The rational function will be undefined wherever the denominator is zero. x≤ -3; 1≤ x ≤ 2; x≥ 3. 1. Determine the real numbers x satisfying x(x +x)>2. Hello class inequality is one of the most interesting topic one need to know as to advance in the world of mathematics. example 5 is less than x, implies that 5 is not inclusive but that the numbers are 1,2 3,and 4. @Emmanuel Blessing x(x+2) is the L.C.M of the algebraic fraction (3x+4)/x greater than or equal to 3x/(x+2). 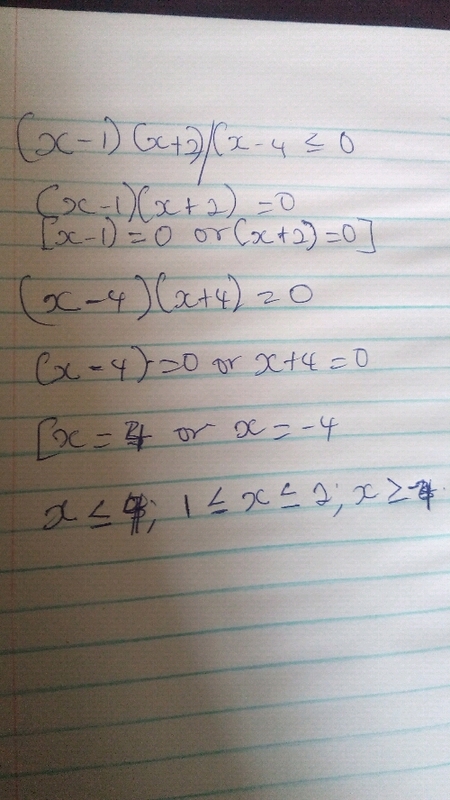 @Emmanuel Blessing thanks for giving a try ,but want you to check your working solution to no.4. Stay close the solutions to the questions will be post after the section is over.